2 TOKYO (Reuters) – Japan plans to dispatch its largest warship on a three-month tour through the South China Sea beginning in May, three sources said, in its biggest show of naval force in the region since World War Two. China claims almost all the disputed waters and its growing military presence has fuelled concern in Japan and the West, with the United States holding regular air and naval patrols to ensure freedom of navigation. A spokesman for Japan’s Maritime Self Defence Force declined to comment. 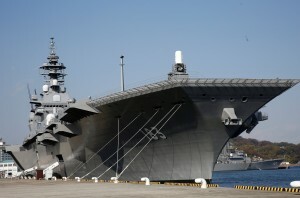 The 249 metre-long (816.93 ft) Izumo is as large as Japan’s World War Two-era carriers and can operate up to nine helicopters. It resembles the amphibious assault carriers used by U.S. Marines, but lacks their well deck for launching landing craft and other vessels.